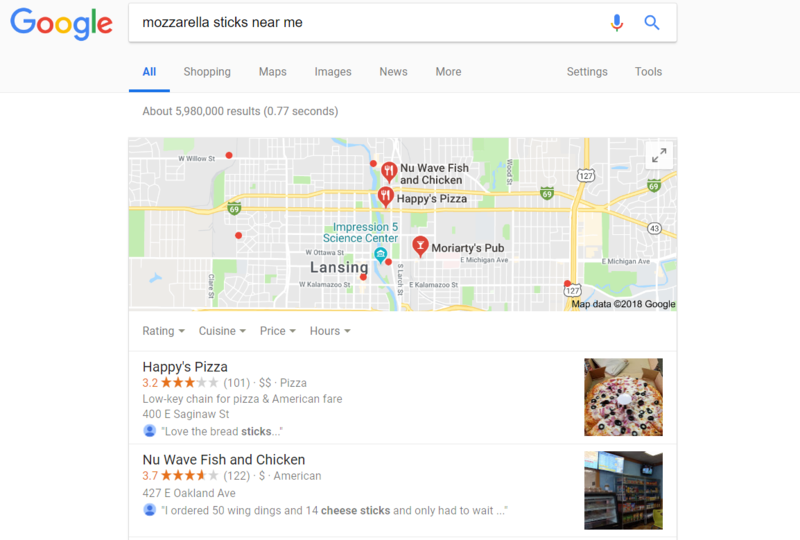 Have you ever searched “food near me” to find a potential lunch spot? Or googled a business to see if they’re open? Did you find these knowledge cards? Now, what happens when you search terms related to your business? With Google knowledge cards’ direct answers to searches and the rise of voice search and AI technology like Siri and Alexa, more and more information is available without ever needing to visit a website. In fact, a study by Yext, a data management company, found that 73 percent of high-intent traffic happens outside of company websites. With this trend on the rise, it’s important to understand what information potential customers are finding so you can make it easy for them to get the information they’re actually looking for. If someone asks Amazon’s Alexa what your hours are or if you offer a specific product, what will she tell them? As voice-based AIs become more prevalent and more trusted, it’s important to optimize your information to be easily understandable for these programs. In addition, more and more people are using voice search on mobile devices, looking for quick answers to their questions rather than searching through multiple sites. Here are some ways to make sure your business’ information is easy for these types of searchers to find. Use Long-Tail Keywords – Hopefully you’re already considering relevant keywords as you’re composing blog posts and other content. Keep in mind that people tend to use more descriptive long-tail keywords that are natural in conversation when they’re searching with AIs, voice search, and mobile devices. In fact, Google found that 70 percent of hotel searches on mobile are for a specific type of amenity, such as “hotel with an indoor pool” or “hotel with jacuzzi in room.” This carries across industries, so make sure you show up when people are searching for the specifics of what you offer. Answer Specific Questions in Blogs and FAQs Pages – When people use voice search on their mobile devices or AI services, they tend to ask questions. Instead of searching “study strategies,” they might say, “Siri, how should I study for this biology test tomorrow?” Your tutoring service’s blog post, “How to Study Science at the Last Second,” will draw AI interest. This also gives you a better chance of appearing as Google’s featured snippet above standard search results. Make Sure Your Google Knowledge Card is Correct – AIs and mobile searchers rely heavily on the information Google provides in knowledge cards rather than sites in the organic search results. According to Google, nearly a third of mobile searches include a query for businesses nearby. Of these local searches, 76 percent convert to a business visit within one day. Nothing is worse than finding a great gelato place for an after-work snack, only to find they moved two years ago. Make sure your correct information shows for potential customers. For in-depth ideas on how to do this, check out our previous blog on Google Knowledge cards. InVerve Marketing & Web can help your business be at the forefront of searches and track down and correct wrong information. Let us know if you’re interested in finding out how we can help your business attract visitors.